How Much Compensation Can I Claim For a Spinal Injury? According to the charity ‘BackUp,’ over 1,000 back and spinal injuries occur in the United Kingdom annually. This is in addition to the estimated 40,000 citizens already suffering from back and spinal injuries. Clearly, spinal injuries are a serious problem in the UK, a problem that affect a large number of people. When that spinal injury has occurred as the result of an accident, there may be a cause for compensation. There are many costs associated with an injury to your back. As well as the cost of treating the issue, there is also the earnings you might have lost and the emotional suffering you have endured. In situations where this pain has been caused by the negligence of another person, these costs can be compensated. This guide is designed to provide information for anyone considering making such a claim. A guide to accident claims for spinal injuries. What to do if you are involved in an accident causing a spinal injury. How to begin a spinal injury claim. What can be claimed after an accident causing a spinal injury? What bones make up the spinal column? The long-term effects of spinal injuries. The most common types of spinal injuries. Assessing the severity of a spinal injury. How much compensation will I get after an accident causing a spinal injury? A Spinal Injury Case study. No win no fee spinal injury claims. Why choose us as your claims service for a spinal injury claim? This guide is provided by our company to ensure that you are able to make a compensation claim after a spinal injury, particularly if you believe that you are entitled to compensation. The guide will gather together all of the information which you need when considering your personal injury claim. This includes what you should do when you have had a spinal injury, how much compensation you could receive as result of your claim, and why you should choose our company as your Claims Service. We’ll also examine the most common types of spinal injury and the ways in which you might be affected by said injury. When considering a compensation claim, this information can prove to be essential. If you are involved in an accident that has resulted in a spinal injury, you should make seeking medical care your first priority. However, once you have ensured your own safety, you should begin preparing for a potential compensation claim. As legal experts, we advise that you begin by gathering evidence concerning your accident. So what steps should you follow? Firstly, you should gather witness statements from anyone present at the time of the accident. This could include witnesses such as other drivers or pedestrians if your spinal injury occurred as result of a car accident. These statements prevent your version of events from being contested after your claim has been made. Secondly, you should find evidence that the accident was as result of negligence on the behalf of another party. Returning to the previous example, this could include an invalid driver’s licence or a disregard for road laws (such as leaving an appropriate amount of space between vehicles on the road) on the behalf of another party. Thirdly, you should ensure that you have evidence showing the severity of your injury. For example, after your accident if you were taken into hospital, any test you were given or medical report that was written can act as evidence for the severity of your injury. The actions that you take after your accident, especially gathering information and evidence, can be essential to your claim. If you want our informed and honest opinion regarding your claim’s chances of success, this information is needed to provide you with an accurate assessment. This is especially true for evidence in support of the severity of your injury, as spinal injury compensation payouts are largely determined in this manner, as demonstrated by the spinal injury claim calculator included below. Given how debilitating a spinal injury can be, an injury can leave you entirely unsure of what to do next. If you are already considering legal action, then your injuries can seriously undermine your ability to move forwards. This is not only true in a physical sense, but with regards to the complicated nature of the laws involved. This is why we always advise clients to make contact with a law firm when considering serious legal action. If you wish to begin a claim, this is what we recommend. As previously mentioned, the first step you need to take is to gather the evidence necessary to support your claim. This could include witness statements, medical reports, and photographic evidence of the accident scene or injuries. Particularly in the cases of accidents that have caused spinal injuries, evidence such as x-ray scans of your spine and long-term physiotherapy reports can be used as effective evidence. Once armed with this evidence, you should find a legal firm to help you. If you contact our offices, for example, we will help you collate this evidence and provide you with our expert opinion as to whether you have a legitimate claim. We do this by offering all potential clients a free legal consultation. In this consultation session, we will assess how justified that we believe your spinal cord injury claim to be and honestly evaluate its chances of success. To do this, we will combine our years of expertise in the industry with the evidence that you can hopefully provide. If, after this consultation, you choose us as your Claims Service, we can proceed with bringing your compensation claim to court. This will involve completing further fact-finding (such as looking at CCTV footage) and even arranging local medical assessments to provide a detailed evaluation regarding the severity of your injury. Once you agree to hire our team, we begin to examine the case in the strictest possible detail. After this, we may take your compensation claim to court. In other situations, cases are settled before this stage. In either eventuality, thanks to our ‘No Win, No Fee’ policy, we won’t charge you legal fees unless your claim is successful. Care at home – the cost of hiring care in your home can be claimed as compensation if your back injury has left you unable to fully care for yourself. Rehabilitation – rehabilitation can be a significant long term cost for a back injury victim. It can include visits to a physiotherapist and so on. Adapting or buying a new home – for long term injuries, it might be necessary to make modifications to your home (or even call for you to purchase a new home) in order to provide a suitable living environment. These costs can be claimed in the case. Access to treatment not available on the NHS – such treatments could include either visits to a private practice or even visits to foreign health specialists in the event that such visits are deemed necessary. So, clearly there are many different things that you can claim compensation for related to your spinal injury. However, as previously mentioned, the amount of compensation that you can receive for any of these costs does still heavily rely on the severity of your injury and the kind of injury that you have suffered. Before you make your spinal injury compensation claim, you may want to consider the medical and biological aspects of your injury, not just the legal aspects. How could you be expected to make a damaged vertebrae claim without the basic biological knowledge needed to know what vertebrae are? The first, and most essential, of these categories is the cervical vertebrae. These 7 vertebrae cover the area of the spinal column in your neck and carry the entire weight of your head. Injuries to these vertebrae are typically extremely damaging and can result in quadriplegic paralysis. This means that a cervical injury claim is usually linked to large compensation amounts. The second of these categories is the thoracic vertebrae. These 12 vertebrae cover the upper and middle sections of your back, supporting the ribcage. Injuries to these vertebrae can potentially be deadly, as major damage can result in ribs coming loose and piercing organs within your chest. This also means that a thoracic injury claim will have weight when considering compensation amounts. The third of these categories is the lumbar vertebrae. These 5 vertebrae cover the lower area of your back to give support to your upper body. Injuries to these vertebrae are common, especially through heavy lifting, and as such a lumbar injury claim might be less likely to deliver the highest compensation amounts. The fourth of these categories is the sacrum vertebrae. These 5 vertebrae connect your lumbar vertebrae with your hips, thereby allowing more freedom of movement. However, this means that they can be easily injured, particularly after a slip or falling accident. This also gives any sacrum injury claim some credence while reducing the average amount of compensation paid out. Finally, the fifth of these categories is the coccyx vertebrae. These 4 vertebrae connect your hips with the muscles of your pelvic floor, leaving them difficult to injure severely. However, severe and moderate injury are still possible and can happen, especially after traumatic events such as car accidents. The inherently traumatic nature of spinal injuries – especially moderate and severe spinal injuries alongside paralysis – leave many sufferers with long-term effects that last for many years after their initial accident. The most obvious and common long-term effect of spinal injuries is extended periods of intense pain and damage done to quality of life. These effects can be felt with almost any spinal injury and can cause great stress and high medical costs to you as result. However, another major long-term effect of spinal injuries is organ dysfunction, particularly in relation to the kidney and bowels. This effect as not only a financial effect due to long-term rehabilitation and treatment but also a significant psychological effect, particularly when associated with bowel dysfunction, which can cause chronic self-defecation. Another long-term effect that is not advertised enough to people who are suffering from spinal injuries is the damage done to bone density. According to the Spinal Cord Injury Zone, your chance of developing bone disorders such as osteoporosis increases significantly after a spinal injury. This can then cause further complications, such as pain and additional accidents. The most common type of partial spinal injury that you could suffer from is anterior cord syndrome. This spinal injury involves damage done to the sensory pathways within the spinal cord, leading to coordination and movement troubles. If you are considering making a spinal cord injury claim, take into account that the average spinal cord injury compensation amounts are the smallest of any spinal injury claim. The most common type of complete spinal injury that you could suffer from is, contrastingly, quadriplegia. This injury results is a varied paralysis of your body from the neck down, typically affecting your bowels and legs. As this is also one of the most severe spinal injuries that you could suffer, it typically received the maximum compensation amount for a spinal cord injury claim. When you begin to make your compensation claim for a spinal injury, you will quickly discover that the severity of your injury is the most heavily weighed aspect of your claim. This severity directly impacts upon the amount of compensation that you can receive for your accident and, as such, it needs to be judged accurately and fairly. If you are not able to have this done, our company is even able to arrange a local medical assessment for you, because we understand how important this is to your claim. While minor spinal injuries are typically judged to be causing only minor trauma and are recoverable with time and non-invasive medical treatment, other injuries can differ. As you will see later in the guide, these injuries receive the smallest amount of compensation even if successful in court. Moderate spinal injuries are judged to be causing significant but treatable trauma, assisted through either long-term rehabilitative therapy or invasive surgery. These injuries can receive a significant sum of compensation if successful in court, but still not as much as severe spinal injuries. In contrast, severe spinal injuries, including paralysis, cause significant untreatable trauma to you and can typically only be helped with closely observed long-term therapy and pain management. These injuries receive the largest compensation amount if successful in court. Providing the answers to these questions can be difficult. Each case is unique, bringing with it many differentiating factors which will need to be examined. As well as this, the full extent of your injury and its long term effects will need to be diagnosed. However, we can provide an estimate. The below table can provide a rough estimation of how the severity of a back injury can impact the amount of money you receive. Severe Back Injury An injury such as partial paralysis or organ failure that is permanent. £29,475 - £122,350 Can be over £1 Million with loss of earnings. Paraplegic Paralysis Paralysis of the legs/from the waist down. £166,500 - £216,000 Can be over £1 Million with loss of earnings. Quadriplegic Paralysis Paralysis of the body/from the neck down. £246,750 - £307,000 - Can be over £1 Million with loss of earnings. As demonstrated in the table, the average amount of compensation directly varies in accordance with the type and severity of your injury. This is why our company devotes so much time and support to rigorous medical assessment, even arranging a medical assessment and a range of tests to determine the severity if you are unable to do so. Spinal Injuries Caused by a Car Accident or a Road Traffic Accident? Unsurprisingly, the major cause of spinal accidents in the UK is car accidents, or other road traffic accidents involving motorcycles, cyclists or pedestrians. The physical trauma experienced in a high-speed road traffic accident can very easily break the upper spine or neck. Car safety belts, airbags and neck supports can only prevent injury in lower speed car accidents. At higher speeds, serious injury is very likely, with neck and spine damage being common. 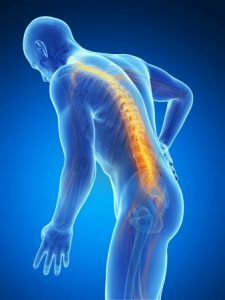 Spinal Injury after an Accident at Work? Spinal injuries in the workplace are extremely common. However, work related spinal injuries are usually at the minor to moderate end of the severity spectrum. Lifting or moving heavy objects is the main way that spinal injuries at work happen, and this leads to spinal damage such as disc or vertebrae being forced out of place, or supporting muscles being strained, ripped or torn. Back injuries and spinal injury accidents at work can happen due to many reasons including not receiving the correct training. Spinal Injuries due to Medical Negligence? Medical negligence compensation claims are always a very serious matter. This is due to the fact that the medical professional who is to blame for the injury, faces very serious repercussions if they are found to be at fault. And of all injuries caused by medical negligence, a spinal injury can have the most serious effect on the victim’s quality of life. In the most serious cases, a spinal injury due to medical negligence could leave the victim paralyzed from the neck down. Typically, such as serious injury such as Cauda equina syndrome (CES) would see compensation of around £500,000 or more being awarded. We often find that those people who might be interested in a compensation claim are bombarded with information from every corner. While this information can be useful, it can be hard to visualise the process of making a compensation claim. As such, we’ve found that including a case study can help illustrate the process. Though this case will almost certainly differ from your own, it is likely that you will touch on a number of key points along the way. In this case, the claimant suffered an injury to their lumbar vertebrae after being involved in a car accident. Later, it was demonstrated that the accident was not their fault. This lower-spine injury was then found to have long-term effects, with the claimant developing chronic pain syndrome. They were left unable to continue working and unable to develop and maintain meaningful relationships with their family and friends. The impact on their life was huge. The claimant in this case successfully sought compensation for their accident and received £90,000. This was based upon mainly the severity of the injury and the long-term future losses of earnings. The costs that that claimant was going to incur as result of the injury – physiotherapy and specialist equipment – were also important considerations in reaching the final total. Your injuries may be similar to this. They may be more or less severe. The circumstances of your accident might be entirely different. However, the process of launching a legal claim with the help of our law firm will likely remain the same. Hiring a Claims Service can be expensive. If you have done any research into legal fees, you may well have encountered the high costs of hiring the best lawyers. In situations where an injury is actively costing you money, from medical costs to lost wages, this can be a real issue. But there is another option. Our company can offer you a ‘No Win No Fee’ policy. Rather than charging up front costs to clients, we simply take a small cut of the compensation amount. If you do not win your claim, then you will not have to pay. This policy, also called a ‘Conditional Fee Agreement,’ means that we only charge for our services on the condition that we win your compensation claim in court; if your claim fails, you won’t have any legal fees or debt to add to your worries. For those already struggling with an injury, this can make a huge difference. If you do decide to make a personal injury claim for your spinal injury, you will need an exemplary Claims Service to ensure that you receive the compensation that you deserve. Choosing to hire our team is an easy decision. We won’t just waste your time filling out a basic back injury compensation calculator; our years of experience in dealing with personal injury claims means that we know that each case is unique and deserving of expert attention. We treat spinal injury claims with the care and expert attention they deserve. We have developed a deep understanding of spinal cord injury claims and how to maximise your chances of being successful through years spent in the legal trade. Our team of legal experts will act carefully and efficiently, leaving nothing to chance. They will provide you with assistance in your claim throughout the claims process and give you exemplary advice on how to proceed with your case. In addition to this, the fact that we can arrange for a free legal consultancy session, an appointment with a local doctor, and can offer a ‘No Win No Fee’ agreement, means you are always treated with care. From the information provided here – it should be clear to you that – with our company as your Claims Service, you will receive the best possible treatment we can provide and ensure you have the best chance of receiving the compensation that you deserve for your spinal injury. If you believe that you have a legitimate claim for compensation following a spinal injury caused by an accident, you need to contact us right away. There are two ways to get in touch. You can either call us on 0800 073 8804 or you can fill out the contact form on our website. We’ll get in touch and arrange for a free consultation session at a time which suits you. How Much Compensation Can I Claim For a Motorcycle Accident? Have you suffered a spinal injury due to a motorcycle accident? Contact us today for free advice or to start a claim. The Spinal Injuries Association is a Spinal charity helping the 40,000 spinal cord injury victims in the UK to help rebuild their lives. Paralysis can be classified in a number of different ways. It can affect particular part of the body visit this link to find out more about Paralysis Symptoms click the link. Treating paralysis – there is currently no cure for permanent paralysis. Find out more about Treating paralysis by visiting this NHS website link. Useful information and resources for spinal injury help links.